The terrorist attacks of September 11, 2001, opened a new era of muscular and assertive American Foreign Policy, ostensibly branded as George W. Bush's "The War On Terror". Terrorism and war continue unabated. The bankruptcy of Lehman Brothers on September 15, 2008 was yet another canary in the economic coalmine that hastened "The Global Financial Crisis". The after effects of reckless bankers and feckless policy makers are being felt to this day. On September 5, 2016 in Cape Town, South Africa, members of the "Working Group on the Anthropocene" presented findings of their research to the annual International Geological Congress. To the uninitiated, and in lay person's terms "the Anthropocene," defines a new epoch -- one where human activity has become the dominant influence on climate and the environment. Are we sleepwalking to our own environmental oblivion? These disparate events have something in common; the belief that the world is in decline. We hear about it every day, waking up to the morning news, logging on to social media, or reading op-eds from our favourite sources. Jonathan Tepperman, Managing Editor of Foreign Affairs, begs to differ. He argues that it doesn't have to be that way, and it hasn't been that way if we would only bother to look hard enough. Jonathan Tepperman's The Fix presents a very different picture. The book reveals the often-overlooked good news stories, offering a provocative, unconventional take on the answers hiding in plain sight. It identifies ten pervasive and seemingly impossible challenges—including immigration reform, economic stagnation, political gridlock, corruption, and Islamic terrorism—and shows that, contrary to the general consensus, each has a solution, and not merely a hypothetical one. In his close analysis of government initiatives as diverse as Brazil's Bolsa Família program, Indonesia's campaign against extremism, Canada's early embrace of multiculturalism, and Mayor Michael Bloomberg's reform of the New York Police Department, Tepperman isolates the universally applicable measures that can boost and buttress equality, incomes, cooperation, and cohesion in wildly diverse societies. He flips conventional political wisdom on its head, showing, for example, how much the U.S. Congress could learn about compromise and conciliation from its counterpart in Mexico. 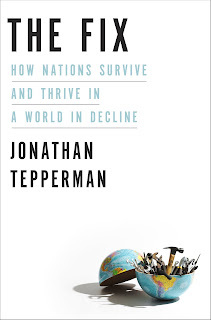 Even if yours truly isn't as sanguine on the suitability of all the policy prescriptions outlined by Tepperman, there is no denying that the he did his research --both primary and secondary-- in articulating the various issues and their eclectic solutions. I respected the accessibility of the prose; too often such books delving into challenges in international relations, economic policy and political conundrums delve into esoteric nomenclature that would send one scurrying for a graduate text for greater clarity. Furthermore, the strength of the arguments are firmly grounded in the reality that economics and politics are intertwined in a Gordion knot. They cannot be separated. We often quote Otto von Bismarck as stating that "Politics is the art of the possible" -- that notion is shown in its messy glory in all the ten cases outlined in The Fix. In hindsight, the art of the possible isn't always right, and it is never perfect but always necessary. Notions of Margaret Thatcher evoking that "there is no alternative" should give way to pragmatism and thinking big. 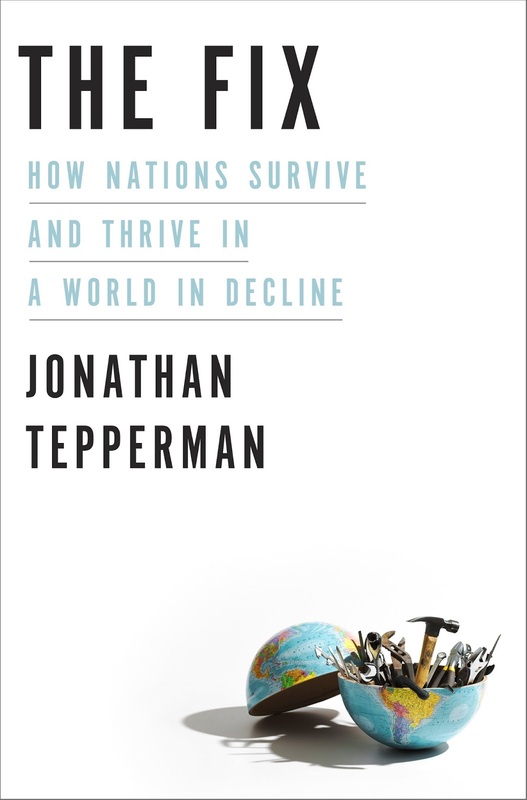 We are not at the "End of history" and as Tepperman argues, with bold and imaginative political leadership, we need not be in an era of unending decline. You, like me, don't have to agree with everything the author writes but it always helps to get a different frame of reference to see what has (and has not) worked elsewhere in this complex messy world we live in. Reviewed by Arijit Banik, who firmly believes that respecting the importance of politics and economics trumps mathematical abstraction in the real world. The Fix is published by Tim Duggan Books, A Penguin Random House Company.